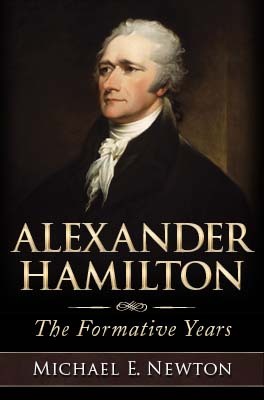 According to nearly all historians, Alexander Hamilton remained at the Robinson house while Washington went over to West Point and it was Hamilton who received the important packet of papers during the commander-in-chief’s absence. * Indeed, a number of contemporary reports and subsequent eyewitness accounts state explicitly that Hamilton stayed behind at Arnold’s headquarters and received the packet. However, these reports disagree on many details and have numerous other problems that call their accuracy into question. Most contemporary reports regarding the events of September 25 make no mention of Hamilton staying at the Robinson house and receiving the packet. The anonymous letter written by James McHenry dated September 26 and published in The Pennsylvania Packet a week later says nothing about Hamilton staying behind and receiving the packet, even though it mentions Hamilton’s later pursuit of Arnold. Another account dated September 28 and printed in the same issue of The Pennsylvania Packetalso makes no mention of Hamilton staying behind and receiving the packet, even though it too mentions Hamilton chasing after Arnold. Washington did not mention Hamilton in his report to Congress, nor in any of his other letters about the events of this day. Hamilton did not mention staying behind or receiving the packet in his letter to his fiancée, even though he mentioned his pursuit of Arnold. Lafayette also failed to mention Hamilton staying behind and receiving the packet in his letter written at the time, even though he also mentioned Hamilton’s pursuit of Arnold. Furthermore, no known published account or history prior to 1828 claimed that Hamilton stayed behind at the Robinson house and received the packet. Lack of evidence is not evidence, but it is telling that the story of Hamilton receiving the packet in Washington’s absence was not mentioned in any published work for nearly fifty years after the event. According to all accounts, Peggy Arnold started swooning and acting frantic just after Washington left Robinson’s house for West Point and long before he returned from there. David S. Franks added that “Mrs. Arnold’s unhappy situation called us all to her assistance.” Thus, if Hamilton had stayed at Robinson’s house, he not only would have heard Peggy’s distress, but he also would have been among those who assisted her. In fact, a number of historians have said that this is exactly what happened. Since Hamilton wrote that he did not witness Peggy’s distress until after he returned from chasing Benedict Arnold, he could not have been at the Robinson house during Washington’s visit to West Point and could not have received the packet of documents taken from John André. Instead, Hamilton must have gone over to West Point with George Washington, Henry Knox, Lafayette, and the rest of the party. * James Fenimore Cooper, Notions of the Americans 1:285; John C. Hamilton, The Life of Alexander Hamilton 1:262; Sparks, The Life and Treason of Benedict Arnold 243 and 246; Leake, Memoir of the Life and Times of General John Lamb 261; Lossing, The Pictorial Field-book of the Revolution 2:159; Washington Irving, Life of George Washington 4:132–133; John C. Hamilton, History of the Republic2:54–55; George Canning Hill, Benedict Arnold: A Biography 252; Sargent, The Life and Career of Major John André 332–333; Riethmüller, Alexander Hamilton and his Contemporaries 83; Morse,The Life of Alexander Hamilton 1:45; Isaac Newton Arnold, The Life of Benedict Arnold 298–299; Fiske, The American Revolution 2:227; Atherton, The Conqueror 205; Fiske, Essays: Historical and Literary1:112; Frank Landon Humphreys, Life and Times of David Humphreys1:180; Hufeland, Westchester County during the American Revolution358; Loth, Alexander Hamilton: Portrait of a Prodigy 96; Schachner,Alexander Hamilton 117; Freeman, George Washington: A Biography5:199; Mitchell, Alexander Hamilton: Youth to Maturity 211–212; Mitchell, Alexander Hamilton: The Revolutionary Years 201; Hendrickson, Hamilton 1:274–275; Mitchell, Alexander Hamilton: A Concise Biography 82–83; Chernow, Alexander Hamilton 141; Alexander Rose, Washington’s Spies 209. In stating that “nearly all historians” place Hamilton at Robinson’s house, this is not meant to imply that some historians have argued against the mainstream account. Rather, some historians simply report that the packet arrived for Washington without stating who received it.